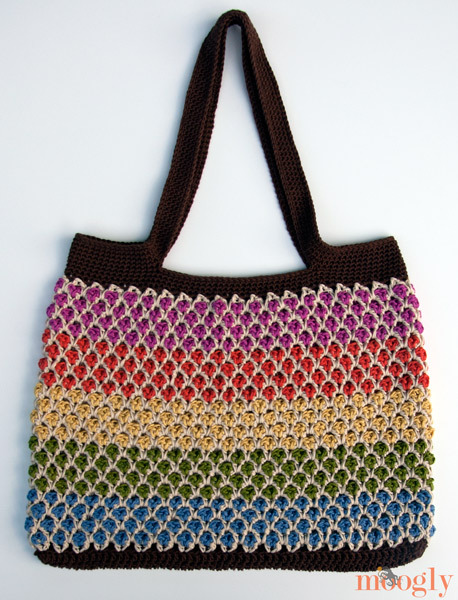 Totes can be utilitarian, handy, functional, and fun. And the Moroccan Market Tote is all of these – plus beautiful and luxurious! 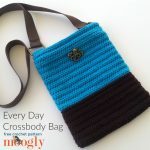 The stitch pattern reminds me of Moroccan Tile (hence the name), and is gorgeous enough to carry anywhere you go – Farmer’s market to foreign shores! The Moroccan Market Tote features 7 bright colors, but could be made with just 3 skeins if you prefer to skip the stripes. As it’s written, less than 50 yards of each “stripe” color is used, so it could also be a great stash buster. But if you get a chance, I highly recommend the LB Collection Cotton Bamboo – it’s a joy to work with, and looks and feels amazing in the finished project! Round 10: With Color D, repeat Round 2. Round 12: With Color D, repeat Round 4. Round 13 – 16: Repeat Rounds 5-8 (using Color D). Rounds 17 – 24: With Color E, repeat Rounds 9-16. Rounds 25 – 32: With Color F, repeat Rounds 9-16. Rounds 33 – 40: With Color G, repeat Rounds 9-16. Round 10: Sl st in the next st and each st around. Break yarn and seamless join to first sl st. Use remaining yarn to sl st around handle openings in the same manor. Weave in all ends. Splendiferous! The Moroccan Market Tote is a truly luxurious tote bag, and I can’t wait to use it. Jetting off on an adventure, strolling through the local shops, or toting books to the public library, it’s sure to add an extra special touch to your next outing. What is your secret to not have the straps stretch? I have made purses in the past. Have the straps the exact length they need to be and as soon as I put stuff inside they stretch out. By the end of the day, the bag is hanging to my knees! That is a great idea! The bag is beautiful! Thanks for sharing!! Another thing you could do is slip stitch around the edges of the straps, tightly. That should prevent stretch. I’ve made straps out of canvas webbing like sail ties in a contrasting color. Make two continuous loops of the same length circling around the bottom of the bag and stitch in place. . Sounds perfect – and strong!! Bee-yoo-tee-ful! Great design, love the colors! Thank you for this great pattern! So often the free patterns are not desirable. You’re very welcome Lisa! I try to do my best, free and paid! Love it! Cant wait to try it!!! This makes me so excited! I’ve got new bags coming out on my product line and I just LOVE this one too! 😀 I don’t use bags (except for the diaper bag) or purses, so I never thought I’d be getting into making them, but BOY was I wrong. Thanks for the pattern!! 😀 You’re very welcome – and thank you! I love this pattern, can’t wait until I have time enough to try it. 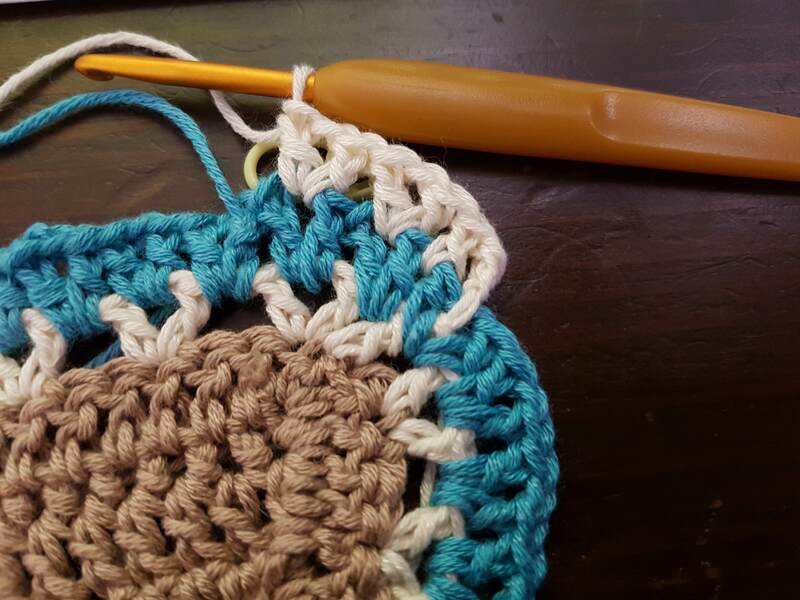 So is the angled seam for each round a normal thing for crocheting in the round? I had that happen on another project and was worrying I did something wrong, even though I counted. Beautiful! Definitely going in my queue for xmas presents. Not sure who will get it, but someone will! Every time I go on Ravelry and see something that just jumps out at me it always seems to be one of your designs. Thank you for another AMAZING one! <3 Thank you so much Jade! I love this bag! Could you tell me please the finished size? Hi Darlene, thank you! It’s 15-16″ wide (narrows a bit as it goes up) and 11-12″ tall not including the handles. Your bag is beautiful! Thanks so much for sharing the pattern! i just tried a little sample and realized reading is everything! there is a difference between “inbetween” and that solved my problem. this pattern is great for black yarn which is my nemesis as well as for all those one ball skeins i bought on impulse/not enough to complete a scarf with. 😀 You’re very welcome diane! I have enjoyed looking at your patterns. You do very nice work. 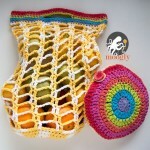 I initially saw one of your patterns on the Daily Crocheter site. Several of your patterns have been featured. The Moroccan Market Tote is exquisite. The pattern is wonderfully unique and your choice of colors are beautiful. Thank you for sharing your work with other crocheters. It is nice to be able to acquire a beautiful pattern, free or paid for, without having to buy a whole magazine for one or two patterns. Thank you so much Pam! Your comment has lifted my spirits today! Very pretty bag!! Lovely stitch 🙂 I have pinned it and will surely try it someday. Thanks for sharing, Tamara!! WHAT DOES CSDC MEAN? I HAVE BEEN CROCHETING FOR MANY YEARS AND NEVER HEARD THIS BEFORE. This is so gorgeous!! Thanks for sharing the pattern! Thanx very much, Tamara; I do like the Moroccan bag also! Tried to make the very beautiful Moroccan Market Tote. Unfortunately I did not follow instructions well and came up with my own very pretty bag. Next time I will follow more carefully. My comment is more to thank you for the wonderful new method if creating stitches that i learned learned along the way. You are a genius! Thanks ever so much for sharing your talent. Sorry for the confusion! I’ll try to word it a bit better. Is there a way to find out what those abbreviations mean without videos? I can’t view videos properly. Is there a way to make this bag with normal stitches, or are the unusual non standard stitches that have to have their own videos the only way to make it? Hi Catlady! The abbreviations are defined in the link text (ie: FDC – Foundation Double Crochet). If you go ahead and click on the video tutorial links, it takes you to posts here at moogly, most of which include photo tutorials or written instructions as well as the video tutorials. If you don’t want to learn new stitches, you can substitute a row of ch and dc for the FDC, a ch 3 for the CSDC, and a sl st join and ch 3 for the STDC. Gorgeous pattern, I just love it! Guess what… I used it to make a cowl. Will send you a pic soon. I have question on the handle for the Moroccan market tote for the handle. You indicate to ch 100, then sc in next market st ( skip stitches between. If I skip the stitches and go across to my next pm, is there a part where I will cut the stitches in the middle? to go across, I will have to stitch thru the bag to get to the other side. The ch of 100 is the start of the handle, so skipping the the sts between the markers creates a big loop of ch sts, with the rest of the bag at the bottom. No cutting! You skip the sts between the 1st and 2nd marker, and between the 3rd and 4th – two rows of ch sts connect this open space. Does that help? Thank you for sharing such a beautiful bag! No more getting my bags ‘accidentally’ picked up by other shoppers in the store…mine can now be as unique as I am!! 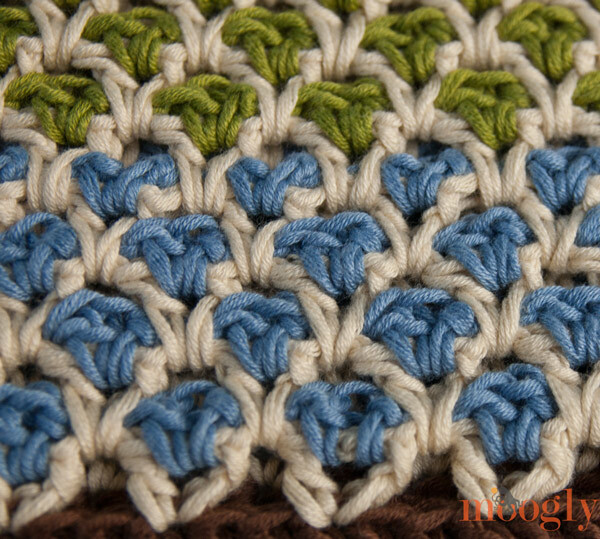 And, this pattern is so much stronger than others I have seen… plus (yes, yes, lots of pluses!) it will still lay flat when empty. These will be too obviously mine to get lifted from the checkout with the previous order’s buggy. 🙂 I don’t think the baggers intend to do it. I think it’s just a matter of them seeing so many of the same kinds that they don’t know when one order is finished and in the buggy and when another begins…they get distracted or busy and next thing you know, you get home and you are missing a bag (and it’s contents) while somewhere else someone has a new market bag (and it’s contents) that they didn’t expect to get. I will make mine in bright colors so that they have to attract attention. Then the they will all end up in the same buggy, mine! 😀 So glad you like them Dani! Good luck keeping it lol! Thank you Mahima! You’ll want to look for a tightly woven, smooth yarn – nothing fuzzy. And look for words like DK or sport or a “3” on the label. I hope that helps! This is one of the prettiest bags I’ve ever seen! I started yesterday morning and only have to finish the straps now! Thank you for another gorgeous pattern!!! 😀 So glad you like it Bethany! Hi Tamara thanks heaps for sharing this pattern. It’s a beautiful tote bag. As soon as I saw this I started working on it. Have finished the main body but got stuck with the handle. While doing the the 3 sc in each chain space it creates a curl/ wave look all across & doesn’t seem quite right compared to the picture of ur bag. Can’t figure out where I’m going wrong. Please help!!!!!. Thanks Tamara, will try that way. Can’t wait to see the finished bag. Lindo trabalho e lindo ponto, parabéns, postei em meu blog, a foto da bolsa, obrigada por compartilhar! Hi ,beautiful pattern !!! While making the bag,inner side comes out to be better than the side worked…..am I going right? This is adorable! I’m excited to try it out, but was wondering one thing- what if I used worsted weight yarn? That’s mostly what I have and would love to use up a bunch of my current supply of yarn rather than going out and buying more. Would it just make the tote a bit bigger? It’s 15-16″ wide (narrows a bit as it goes up) and 11-12″ tall not including the handles. Hi, Can you show a video tutorial of how to do the V stitch. I am getting confused over there. 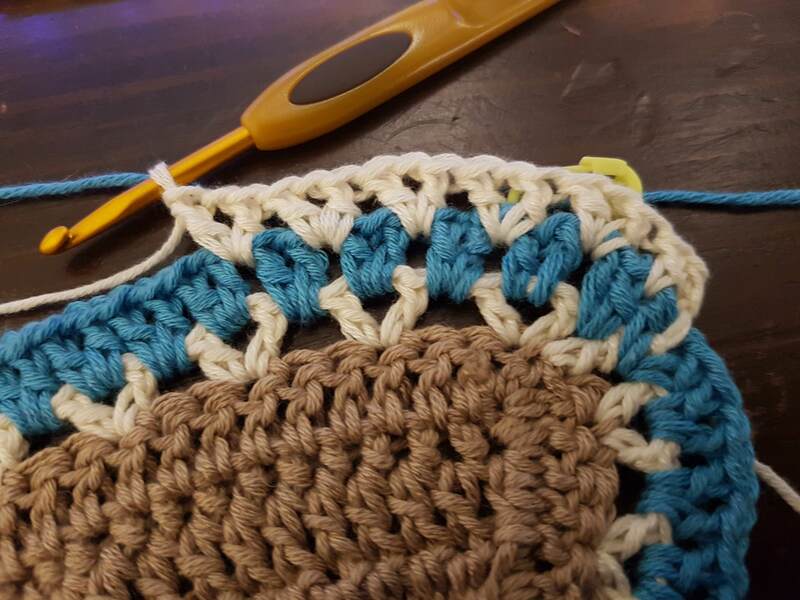 hey i am making this purse for my aunt and i am having some confusion….i am using only three colors….know right…she wants for her fave football team….i can still do this right…. Hi, I’ve made this bag before but now want to try and make a smaller version using nylon thread. Is there a pattern size guide i.e, chaining 34 instead of 54? Hope my question makes sense. The key is making sure that after Round 3 you have a number of stitches that is a multiple of 3. (and you could probably fudge it a little if you were close!) I bet it would look amazing in thread! Wow! This is a really awesome bag!! I’m looking at the color options in the LB Cotton Bamboo trying to figure out how to cheap out and only get a few skeins but all of the colors look so great together! Thanks so much Karen! 😀 I did go back and forth between doing the stripes or just 2 colors for the patterned section! I noticed the base of the purse is narrow. Does that limit how you can use the purse? It’s only a couple inches at most across the bottom. Tamara, love the bag muchly!! And you are just a delight! 😀 Wow, thank you so much Kathy! hi, last night i tried to make a small sample but i kinda stuck in round 3, i guess it was round 3, i tried from your video “Moroccan Tile Stitch in the Round”. 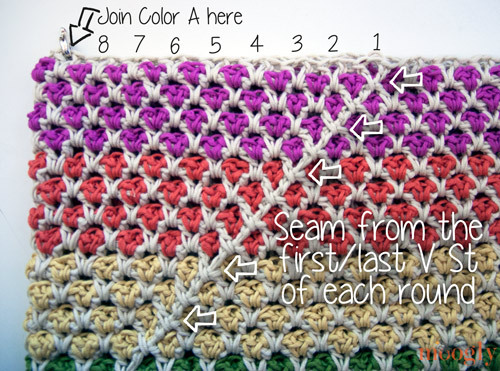 did u pull the yarn tightly when u made the V-sts which including the round 2? what i really mean was the V-stitch in white, do i have to pull my yarn tightly when it covers the yarn in the previous row? i really hope u’ll understand what i mean. 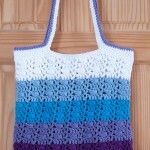 i really love this bag and i think i want to make it in blue with white stripes with acrylic yarns. Hi Ursula! I don’t think I pulled it particularly tightly, though the rows do get squished down into each other a bit. hi! so glad to have your quick reply! so i need to pull a bit, only not to let the yarn becomes too loose, am i correct? can’t hardly wait to make this bag, i’m a totally beginner anyway, so this bag gonna give me lots of tricks to learn. thank u very much for sharing this wonderful pattern!!! I think so! 😀 And you’re welcome! I LOVE THIS BAG! IT WILL BE MY NEXT PROJECT. JUST ONE QUESTION: WHICH ARE THE DIMENTIONS OF THE FINISHED BAG AS SHOWN IN PATTERN? Thank you so much Delphine! It’s 15-16″ wide (narrows a bit as it goes up) and 11-12″ tall not including the handles. Hello, just wanted to say thank you for this patterns on a few different levels. I for one, have never before tried the foundation chain crochet or seen it as part of a pattern. So thank you for that. The first row really does seem to make all the difference. Second, you had other stitches on here that I never did before and I can already tell the huge difference it is going to make in future crochet projects. The csdc is fantastic and so is the seamless cast off. I am half way through this project and i just can’t help but want to thank you for this beautiful pattern. I will follow you from now on!! Thanks!! 🙂 Glad you enjoyed it Roslyn! 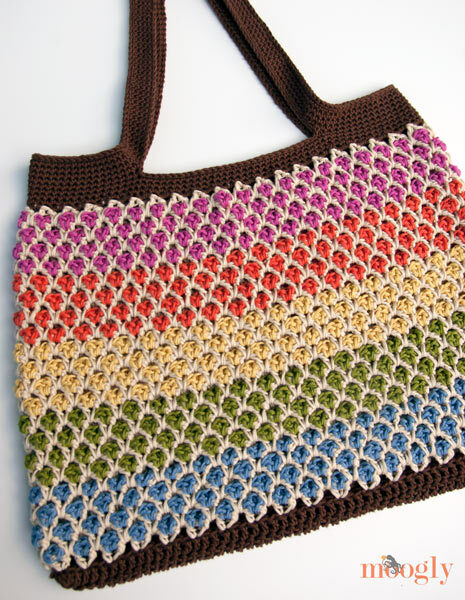 HI, I love this pattern for the Market Tote. I have made a couple of them now. Mine are very square though, and in your photo the bag seems to be slightly narrower at the top. Is there something I am missing to decrease along the way to get that narrowing effect? Thank you, Tamara, for a beautiful pattern with tutorials. I have learned a number of new stitches. I took your advice and made this a “stash buster” bag. It is a rainbow of color, and my 5-year-old loves it. Once I learn how to properly line and reinforce the straps, it may become our library bag. What a fun project this was! 😀 Thank you Kristina, I’m so glad you enjoyed it! RE the above: I tried doing it in the other spot but that didn’t look right either because the beige colours don’t meet in that continuous triangle bit either? Uh sorry to bother you, I love the bag but directions on the handle just baffle me. For the first round of the bag handles, you join to the indicated chain space, then chain 1, and then work 3 sc in each chain space around, starting with the one you’ve joined to. 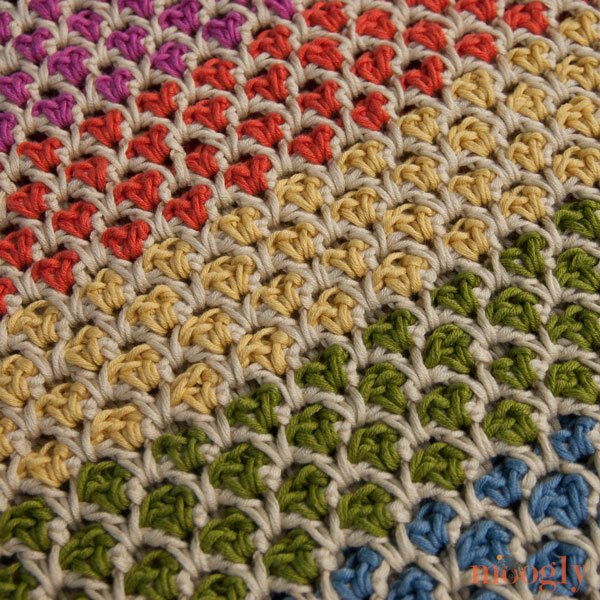 Then at the end of that round, you join with a slip stitch to the first single crochet you made in that round. You don’t cut the yarn again until you’ve finished the bag, just go on to Round 2. Does that help? Thank you sorry for the late reply I was very busy this month. Your detail explanation helped a lot!